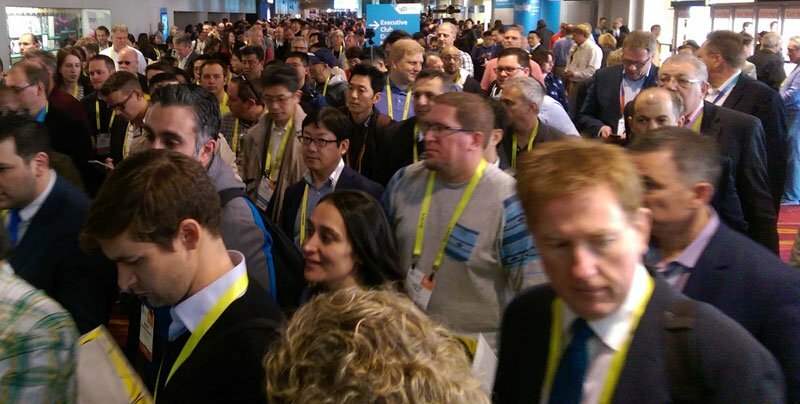 CES 2017 is now one for the record books. Records were broken for both attendance (177,393) and exhibit space. (2.47 million square feet). With exhibits spread out over multiple venues and such wide range of technologies, it was difficult to stay focused on AV innovation and technologies that will have lasting influence in both the professional and consumer future. However, here’s what I felt will have lasting impact. In 2016, HDR10 or High Dynamic Range (HDR) was one of the best things to happen to electronic image reproduction. Dolby Vision takes HDR to the next level. At CES major manufacturers including LG, Sony, TCL and Philips have now licensed Dolby Vision for their top-of-the-line flat panels. HDR10 and Dolby Vision combine the very best characteristics of the ideal image (color, contrast, and dynamic range) and set standards for the manufacturers to meet. Where Dolby Vision exceeds HDR10 is in the dynamic metadata where the image characteristics can change to optimize each scene. Dolby Vision also adds future support for 12 bit video and 2020 color space which HDR10 does not. The really good news is that any display or 4K movie that supports Dolby Vision will also support HDR10 so it’s a win-win move to Dolby Vision. LG’s new very thin “Wall TV” with a separate box for the speakers and electronics. Note the wide ribbon cable connecting the panel and the box. 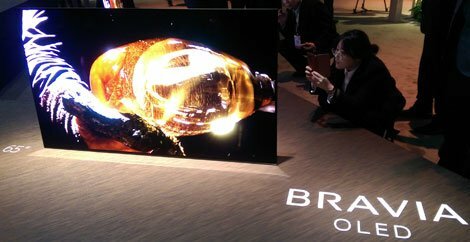 Organic Light Emiting Diode (OLED) TV displays have long been recognized as the holy grail of display technology. This year in addition to LG we now have Sony, Panasonic, and HiSense showing large OLED flat screen TVs which could help bring the cost down. With the addition of Dolby Vision by LG and Sony, and more competitive prices, we may have the ultimate display in 2017. OLED TV is able to produce perfect blacks. And now with expanded color and higher dynamic range with HDR10 and Dolby Vision you have the recipe for incredible images. Sony’s new Acoustic Surface Audio which uses the entire screen itself to generate the sound. Imagine sound that actually comes directly at you from the image itself, not some behind-the-panel facing-down speakers! Sony’s Acoustic Surface uses the entire panel to generate sound directly off the glass. Since manufactures have strived to make their panel frames smaller and smaller, speakers had to be relocated to the back of the panel. Instead of sound aimed directly at the viewer it has had to be bounced off walls, tables and floors to accommodate the smaller frames. Although still not better than a good quality soundbar with a separate subwoofer, it may be just the ticket for many applications. Many new products were introduced that now include Hi-Res Audio (high resolution) including new higher-end sound bars, portable players, and new 4K BluRay disc players. Audio purists have previously favored vinyl records to CD because of the smoothness and the nuances that were lost in the low sampling rate of commercial CDs (CDs are 16 bit, Hi-Res is 24 bit). Hi-Res audio files are now gaining popularity for those who want the best of both worlds – very high quality audio without the hassles of discs and records. 2017 will also mark the start of live streaming services for Hi-Res Audio as well. Just when you thought you had seen the last of physical discs, they are back, and with good reason. Until now home videos (DVD, and Blu-ray) were only 8-bit video files and used a color gamut called REC709. They could only reach a dynamic range of about 8-9 stops of exposure detail and a color sampling of 4:2:0. Now with the 4K version of Blu-ray players (backwards-compatible with both DVD and Blu-ray discs) it is possible, with an HDR-compatible display, to achieve studio quality images of 4:2:2 color detail, 10-bit video (1 billion colors instead of 16 million), HDR (up to 14 stops of detail), and an expanded color palette that includes very rich reds, deep blues, and greens that have previously only been able to be seen in nature. These discs will remain relevant for the near future as the ability of the internet to stream these very high-data-rate files is not practical at current internet speeds. My personal favorite technology of the show was the OLED panels combined with HDR and Dolby Vision. Images once reserved only for the Hollywood content creators on $40,000+ monitors are now available to enjoy in the comfort of our living rooms or commercial displays. Making all of this possible are the new 4K Blu-ray players that finally bring studio quality images (10-bit 4:2:2) with color and image nuances that were previously unavailable for the masses. Throw in Hi-Res Audio and we are definitely living in the future! 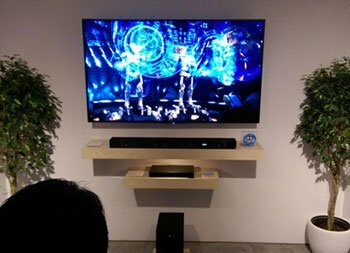 This entry was posted in AV Solutions, Home Theater and tagged 4k, 4k Blu-ray, 4k Bluray, 4k Bluray player, Acoustic surface audio, CES, CES 2017, Dolby Vision, HDR, HDR10, Hi-Res Audio, OLED, OLED TV.